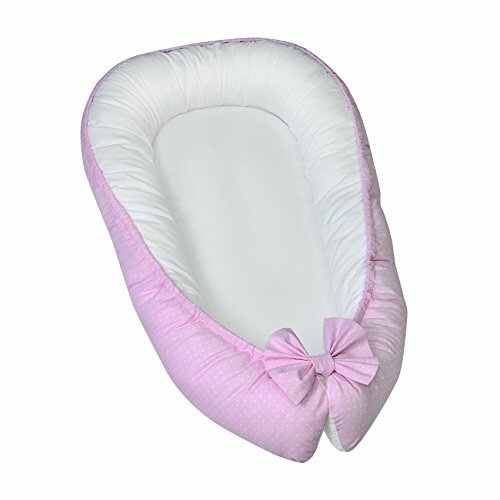 This baby pillow for newborns is created for the little ones to feel like they are in the mother's womb, safe and warm. - Our co-sleeping bed attachment is a lifesaver for moms and dads, allowing parents to have hands-free interaction with their children. - Baby support pillow has a trendy girly theme with white polka dots on a light pink. - For babies 0-6 months old. - Use clasps in closed position for 0-3 months babies and clasps in open position for 3-6 months babies. - Perfect shower gift for a baby girl. - On bed bassinet measurements: whole lounger is 33,5 x 17,7 inch, inner bed is 23,6 x 11 inch. - Baby lounger pillow colors are as in the picture but might vary due to computer monitor or mobile phone settings and lighting. - Care of baby lounger: cover can be washed in a washing machine on a delicate cycle, mattress pad and inner filler of the bumper must be dry-cleaned. - Infant pillow contains zero flame retardants, zero ethylene glycol, and no phthalates or BPA. - Inner filling material is Oeko-Tex Standard 100 Class 1 certified (EU). SAFE SLEEP AND COMFORT FOR YOUR BABY. Your child will feel comfortable and safe in our soft newborn lounger. Such a secure sleeper will allow your baby to have deep and nice sleep as little ones love the imitation of a stay in the mother's womb. It helps with common newborn sleep issues like wanting to sleep in a parent's arms or frequent waking. HYPOALLERGENIC MATERIALS, BREATHABLE AND NON-TOXIC. We use 100-percent cotton fabric and breathable, hypoallergenic internal filler, which is safe for baby's sensitive skin. It will give your child serene, safe, and sound sleep in their lovely co sleeping crib. MULTIFUNCTIONAL AND PORTABLE. Use the infant lounger as a bassinet for a bed, side sleeper, travel bed, newborn pillow, changing station or move it around the house for lounging or tummy time, making baby feel more secure and cozy. The lightweight design and easy-to-use package with handle make our in bed bassinet a portable baby must-have. GROWS WITH YOUR BABY. Being adjustable, the side sleeper grows with your baby. Simply loosen the cord at the end of the bumpers to make the size larger. The ends of the bumpers can be fully opened. HAPPY CUSTOMERS. We love our customers, and we do whatever it takes to make them happy. That is why we offer no questions asked 30-day warranty for all baby nursery bedding products. Add our deluxe baby cocoon to your cart today and order with confidence! View More In Cribs & Nursery Beds. If you have any questions about this product by Lappi Baby, contact us by completing and submitting the form below. If you are looking for a specif part number, please include it with your message.